Review posted May 6, 2014. Paul Dry Books, Philadelphia, 2012. 175 pages. 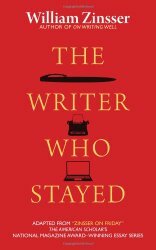 This is a book of essays by a master of the form -- indeed, the man who wrote the book on writing nonfiction (On Writing Well). It's actually a collection of "columns" which were posted online. I would have called them blog posts, but The American Scholar, the magazine that posted them, calls them essays, and coming from William Zinsser, that's completely appropriate. I mostly read an essay per day, kind of like you'd read a blog. Each day I enjoyed having some insightful reading, and something to muse over for the day. The essays are not long, and each word is used well. I want to give you some quotations, to show his wonderful use of language, but that doesn't convey the completeness of each essay, the way he sets up something at the start that pays off by the end. "As a journalist," I tell my despairing students, "you are finally in the storytelling business." We all are. It's the oldest form of human communication, from the caveman to the crib, endlessly riveting. Goldilocks wakes up from her nap and sees three bears at the foot of her bed. What's that all about? What happens next? We want to know and we always will. Writers! Never forget to tell us what's up with the bears. Manage that content. Writers! You must give yourself permission, by a daily act of will, to believe in your remembered truth. Do not remain nameless to yourself. Only you can turn on the switch; nobody is going to do it for you. Nobody gave George Gershwin permission to write "Rhapsody in Blue" at the age of 25, when he had only written 32-bar popular songs. Nobody gave Frank Lloyd Wright permission to design a round museum. Last week I got a letter from the man I once thought of as my broker, who now calls himself my investment counselor and would probably call himself my wealth management adviser if I had any "wealth" for him to manage. He was writing to tell me that Sandra, "the lead assistant assigned to your relationship, has decided to change careers and become a full-time mother of 10-month-old Brad." I didn't even know I had a relationship with Sandra. She never mentioned it, probably because she already had a relationship -- evidently quite a long one -- with the father of 10-month-old Brad. But my investment counselor said he was "happy to announce" that Daniele had joined his office and would now be managing my relationship. A few days later I went into my Citibank branch to get some cash and found a message on the ATM. It said, "Now you can have a dedicated relationship manager!" That got me wondering about Daniele. I knew she would be caring. But shouldn't she also be dedicated? This book contains good writing that will give you something to muse over. Definitely worth dipping into.